Straits Times publisher Singapore Press Holdings has bought 14 student accommodation buildings in the UK, providing beds for almost 3500. The company says it is buying the purpose-built accommodation portfolio acros six UK towns and cities the from Britain's Unite Group for GBP£180.5 million (SG$ 321 million) cash. The purchaser is SPH subsidiaries Straits One (Jersey) Limited, Straits Two (Jersey) Limited and Straits Three (Jersey) Limited. 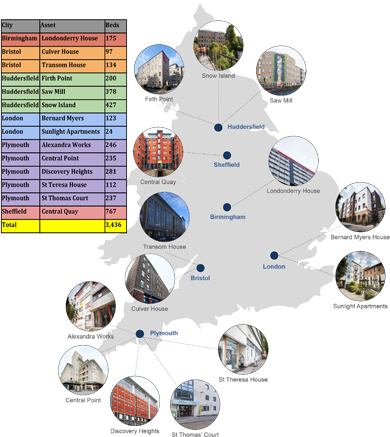 Ten freehold and four leasehold assets are in established university towns and cities including London, Birmingham, Bristol, Huddersfield, Plymouth and Sheffield. "Student accommodation in the UK, which stands at the national average of 2.8 students to each bed, presents growth potential, with demand expected from both domestic and international students," it says in a statement. Rising demand for student accommodation is driven by an increase in first year, international and postgraduate students. "At the same time, in England, a record 27.9 per cent of the 18-year-old population have been accepted for higher education this year, with enrolment projected to grow by 23.0 per cent by 2030. SPH chief executive Ng Yat Chung says the acquisition will generate recurring cash flow, and is part of an ongoing strategy to diversify business to new growth areas. "It will boost our real estate asset management portfolio, establish us as an overseas owner of purpose-built student accommodation in the UK, and allow us to pursue other growth opportunities in this sector." This transaction is expected to complete on or around Thursday (September 13).